You can't get much cuter and spookier than Boppity Boo Halloween Panel. Whimsical witches, frightening Frankenstein, wandering Mummy, scary vampire and so many more ghosts and goblins. 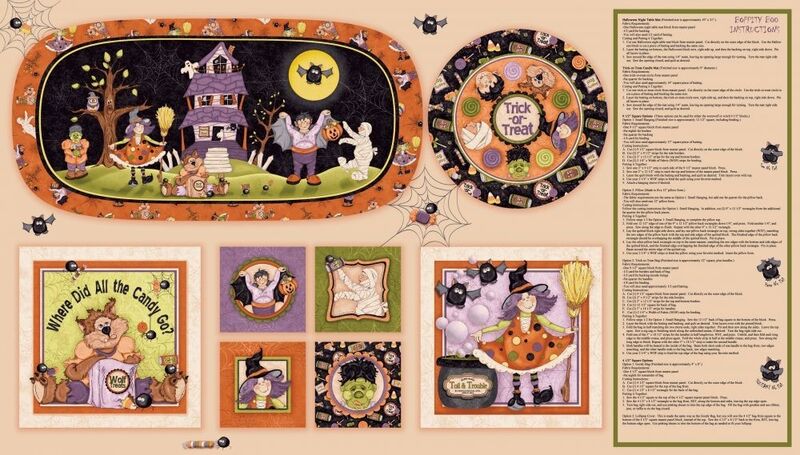 This panel is comes with instructions for a 10" x 21" tablemat, a 9" round tablemat, a wall hanging, pillow, trick-or-treat bag, and for a small goody bag are printed on the 24" x 44" panel. A text print reminding you to "mind your mummy", a toss of candy seekers on a background of spider webs and bats, a candy toss, a stripe, a checkerboard with Halloween images, and a wonderful spider web texture round out the collection. All fabric from The Quilted Nursery Children's Fabric Store is cut directly from the bolt in continuous yardage unless otherwise directed. All shipping overages will be refunded on shipment of fabric. Same day shipping always! Very nice fabric and quick delivery.